They are similar in appearance to the Cigarette beetle but are slightly larger, adults can be up to 3.5 mm in length. Additionally, Drugstore beetles have antennae ending in 3-segmented clubs and also has grooves running longitudinally along the elytra. 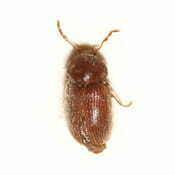 The Drugstore beetle (Stegobium paniceum), also known as the Bread beetle or Biscuit beetle, is a tiny, brown beetle that can be found infesting a wide variety of products, and is among the most common non-weevils to be found there. As their name suggests, Drugstore beetles have a tendency to feed on pharmacological products, including prescription drugs. They will also feed on a diverse range of dried foods and spices, pet food, as well as hair, leather, books, and museum specimens. They can bore into furniture, and in some cases tin foil or sheets of lead. Treatment starts with a thorough inspection, by a licensed pest control expert, for the primary source of the infestation. After that recommendations are made for good sanitation practices and a pesticide application maybe preformed when necessary. Chuck Sullivan Exterminators provides an All Pest Service Guarantee so you won’t have to worry about beetles in your home or commercial building after treatment has been applied.